This season the first play in August Wilson’s ten-play Pittsburgh Cycle, Gem of the Ocean, is revived in Chicago, the city where it premiered in 2003. 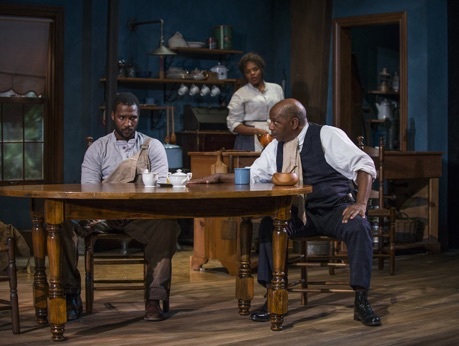 The note-perfect revival takes place at the Court Theatre in Hyde Park not at the Goodman Theatre where it originally was staged. The play is rich in character, incident and language and must count as one of Wilson’s masterpieces. In his Pittsburgh Cycle, Wilson (1945-2005) sought to present the African-American experience in ten plays, one for each decade of the 20th century. Gem of the Ocean was the second last to be written and in many ways sums up the themes of the entire cycle or, viewed as the first of the series, establishes the themes of freedom and cultural continuity that the other plays will explore. Aunt Ester, the main character of Gem of the Ocean, is mentioned in Two Trains Running (1990), King Hedley II (1999) and Radio Golf (2005). 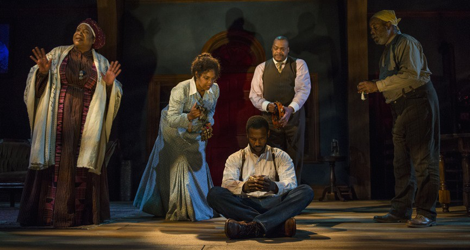 The play is set in 1904 at the home of Aunt Ester at 1839 Wylie Street in Pittsburgh. Aunt Ester (Jacqueline Williams), renowned as a “cleanser of souls” and as a living repository of history, claims to be 285 years old and has taken on Black Mary Wilkes (Tyla Abercrumbie) as her housekeeper and, she hopes, as her protégée. Wilson has not chosen his numbers at random. If Aunt Ester is 285 years old in 1904, she would have been born in 1620. That is the year that slavery in the British colonies in the future United States began when a Dutch ship sold African slaves to colonists at Jamestown. 1839 is the year of the Amistad Rebellion, when inhabitants of a Cuban slave ship rose up against against their keepers. The United States captured the ship and the U.S. Supreme Court, in a ruling that gave strength to the abolitionist movement, ruled that the slaves on the ship should be considered free men. The Amistad Rebellion has echoes in Gem of the Ocean. A black man is accused of stealing a bucket of nails but maintains that he did not do it to the point of drowning rather than give a false confession. This leads the black mill-workers to go on strike. Caesar Wilkes (David Alan Anderson), a policeman and Black Mary’s brother, makes himself a hated figure by ruthlessly enforcing the law against his fellow African-Americans, whom he has already cheated in other ways. Against this turbulent background, Solly Two Kings (Alfred H. Wilson), an old friend of Ester and of Ester’s caregiver Eli (A.C. Smith), learns that the state of Alabama refuses to let its free black residents escape for the north and so resolves to rescue his sister trapped there. Meanwhile, Citizen Barlow (Wardell Julius Clark), a young man who has managed to escape from Alabama, desperately seeks Ester’s help in cleansing his soul for some mysterious misdeed. With its use of symbolic numbers and names, the play is poised halfway between realism and allegory. The highpoint of the play is Ester’s ritual to cleanse Citizen’s soul in which Eli, Solly and Black Mary participate. The ritual involves transporting Citizen mentally and spiritually to the City of Bones, a city built entirely of the bones of those Africans in slave-traders’ boats who did not survive the voyage from Africa to the New World. Citizen must enter this city but a guard watches each of the four gates. To gain entrance, Citizen must confess the sin he is guilty of. Once he awakes from the altered state of mind that Aunt Ester induces, Citizen’s soul is cleansed of that sin and he can move forward with his life. Like most plays about history, Gem of the Ocean concerns the continuity of memory. Aunt Ester, with her 285 years, is the embodiment of the memory of black slavery in North America. That is why she is so anxious that Black Mary will follow in her path and carry on her knowledge. Solly Two Kings, named after both Solomon and David in the Bible, has a memory of life before the Civil War and Emancipation. Throughout the play he tries to set out on a quest to free his sister in Alabama. He carries a symbolic walking stick with a notch for every slave helped reach Canada and freedom on the Underground Railroad. Since he, too, is aged, we wonder who will carry out his quest when he cannot. In complete contrast to Ester and Solly, is Caesar, not accidentally named for the political authority in the New Testament. To save himself he has sided with the white police and carries out their orders. He has so assimilated their point of view that he is as prejudiced against black people as they are and even says, to gasps from the audience, that life was better for black people under slavery. To prove, however, that white views of race are not monolithic, Wilson includes the character Rutherford Selig (Steve Schine), who is always kind to Ester and Mary and is willing to incur danger to himself to help hide Solly from Caesar. The set design by Jack Magaw subtly reflects the realistic/symbolic nature of the play. On the one hand, the set is for the most part a highly detailed and naturalistic rendering of Aunt Ester’s main room and kitchen. But, the wide wooden floor boards of the set curve up at the ends over the rounded front of the Court Theatre stage, thus suggesting the symbolic boat, the Gem of the Ocean, that will take Citizen on his voyage of soul-cleansing. The whole set is beautifully lit by Heather Gilbert, who employs a wide range of techniques to create the mysterious atmosphere of the soul-cleansing ritual. Most impressive about the production is the rock-solid ensemble work of the entire cast under director Ron O.J. Parson. The action naturally revolves around Aunt Ester and Citizen, but ultimately each character has a place as the focus. Jacqueline Williams, who is definitely not 285 ears old, is an absolute joy as Aunt Ester. Though the events of the play takes place only over the course of a few days, Williams shows us how Ester gradually ages and begins to lose some of her facility of movement. Williams has a rich, commanding voice and a face that looks as if it has witnessed all the history she speaks of. Williams also has the charisma necessary to guide a young man like Citizen on his symbolic journey. Williams can brush off an insult Ester might receive from Caesar simply with a well-aimed glare. It’s a fantastic performance. Much the same can be said about Alfred H. Wilson as Solomon Two Kings. He is so named likely because the Biblical Solomon was the last ruler of the United Monarchy before it split into the Kingdoms of Israel and Judah. Solly likewise is old enough to have seen the United States split into the North and South. Solly is basically the outdoor wanderer compared to Ester’s indoor mystic. Wilson invests him with enormous power and authority, but like Ester, he shows us that he now has to fight the effects of age that are starting to diminish his physical abilities. Caught between these pillars of strength and history and borne up by them is Citizen Barlow. On the evening I attended, understudy Wardell Julius Clark replaced Jerod Haynes. Clark fit in so perfectly with the ensemble that had I not read the insert in the programme, I never would have guessed he was a replacement. Though Barlow has committed a crime, Clark gives him such an air of authentic virtue we never doubt that his repentance is real. His character makes the biggest emotional journey in the play, moving from fearful innocence to confident maturity and Clark charts this transformation believably and with great empathy. Parallel to Barlow is Black Mary, played with confidence and spirit by Tyla Abercrumbie. Abercrumbie shows Mary chafing under Ester’s constant criticism but eventually we, and Mary, see that through this criticism Ester is testing Mary’s strength. Just as Barlow becomes more mature and forceful through the action, so does Mary and Abercrumbie so wins our sympathy that we applaud when she finally begins to exercise her own authority. Two further parallel characters are Caesar Wilks and Ester’s companion Eli. Just as Eli respects Ester and his friend Solly and seeks to protect them, Caesar feigns indifference to the two and seeks catch them in illegal activities. Eli’s character is underwritten since we really don’t know how he became so loyal to Ester, yet A.C. Smith’s performance is so strong that we tend not to think about this question until the play is over. David Alan Anderson gives an exciting performance as Caesar, a man torn between black and white cultures and feigning strength to hide his inner weakness. It’s a testament to his acting ability that he can make Caesar’s narrative so compelling concerning how he strove to fit into the white world that we almost forget that Caesar has sacrificed loyalty and identity in doing so. As the sole white character, Rutherford Selig, Steve Schine’s performance provides a useful reminder that not all white people in Wilson’s world on stage are racists and bigots. In fact, Schine suggests that Selig acts out of a sincere affection for Ester, Solly and Mary. Though the play is nearly three hours long, Wilson’s play is so well written, Ron O.J. Parson’s direction so detailed and precise and the cast’s acting so compelling, that the time flies by, so engrossed are we in the action and the characters. 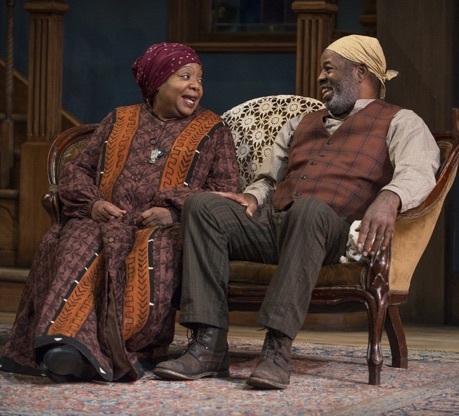 When Toronto Obsidian Theatre produced Wilson’s play The Piano Lesson (1987) in 2003, I had hoped it would go on to present more of Wilson’s cycle. Since it so far has not done so, I am grateful to have seen the Court Theatre’s production of the first of the cycle. I can’t imagine how it could be bettered. Chicagoans should rush to purchase the few tickets remaining. Photos: (from top) Jacqueline Williams, Tyla Abercrumbie, Jerod Haynes (seated), A.C. Smith and Alfred Wilson; Jacqueline Williams and Alfred Wilson; Jerod Haynes, Tyla Abercrumbie and David Alan Anderson. ©2015 Michael Brosilow.